Subfamily Tetraroginae: Eleven plus genera (Ablabys, Amblyapistus, Centropogon, Cottpistus, Neocentropogon, Notesthes, Ocosia, Parcentropogon, Tetraroge, Vespicula) of thirty five species. Very venomous. 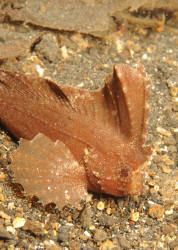 Mostly marine, with the Australian eastern coastal Notesthes robusta being able to be kept in hard, alkaline freshwater. 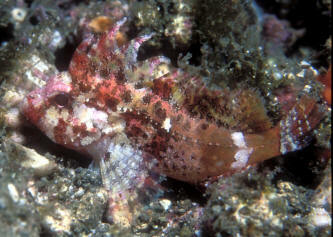 Very venomous... as their affiliation with the Scorpionfishes alludes to... 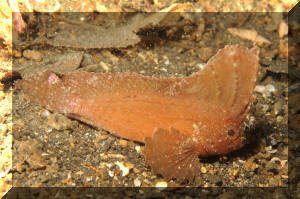 Distinguished from this group by having their dorsal fins originate high on the head. 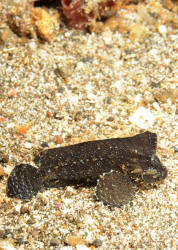 Ablabys taenionotus (Cuvier 1829), the Cockatoo Waspfish. Tropical West Pacific; Indonesia, Philippines, Australia. To six inches in length. Found on sand and mud bottoms. 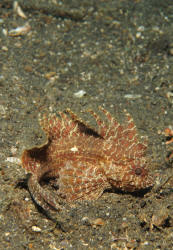 N. Sulawesi photos. Hypodytes rubripinnis Temminck & Schlegel 1843. Northwest Pacific; Japan, Philippines. To four and a quarter inches in length. Aquarium photos. 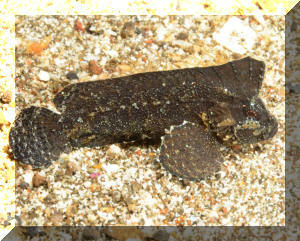 Notesthes robusta (Gunther 1860), the Bullrout. Queensland, New South Wales, Australia. Freshwater, brackish, marine. Best kept in brackish or marine settings. To ten inches in length. 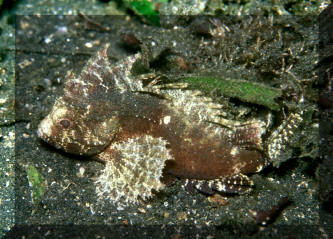 Paracentropogon longispinis (Cuvier 1829), Wispy Waspfish. To 8 cm. Indo-West Pacific; Thailand, Indonesia, Australia. Nocturnal for the most part. N. Sulawesi pic.